Maplewood's Own Bob Hume: What is a French Drain? As a former Brooklynite turned Maplewoodian, I'm always astounded by what your money can buy you in "Brooklyn West" (a.k.a. Maplewood/South Orange) versus Park Slope. you will be paying about $250-$265/square foot and also get a yard and not have to worry about footsteps above you or below. Well, here is your chance to strut your stuff! 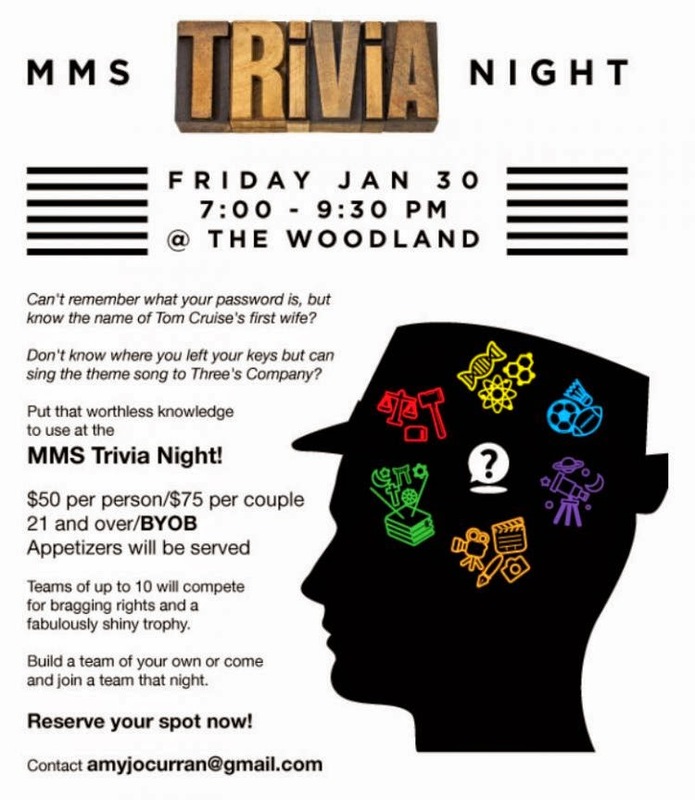 Teams up to 10 will compete for bragging rights! Build a team of your own or come and join a team that night! 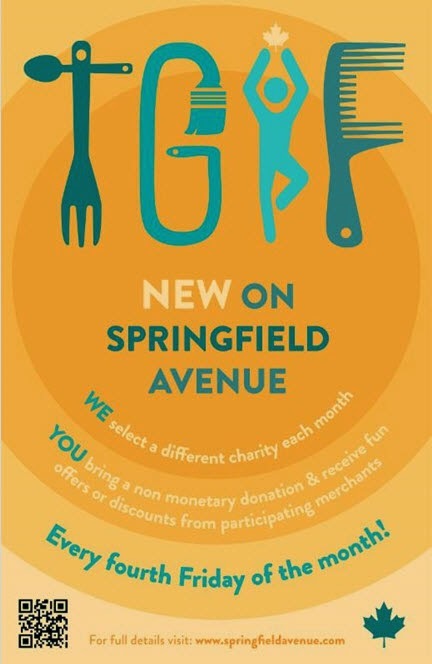 Every “Fourth Friday” of the month when you visit a participating Springfield Avenue business and support the local “charity of the month” you’ll receive a special offer from each participating business. This is a great opportunity to give back to the community while supporting your favorite local businesses. Or, maybe there’s a new exercise class or restaurant you’ve been wanting to try, well, here’s a great way to do just that while benefiting those in need. A list of the charities we’ll be supporting and the types of non-montetary donations they need, followed by the participating businesses is below. Help feed hungry school kids by donating lunch and dinner items that are easy to pack like granola bars, juice boxes, shelf stable milk, crackers, etc. Our BackPack Pals Program provides backpacks full of supplemental nutritious, kid-friendly food to children who are food insecure over the weekend. When a child is food insecure, he or she is at great risk of going hungry. 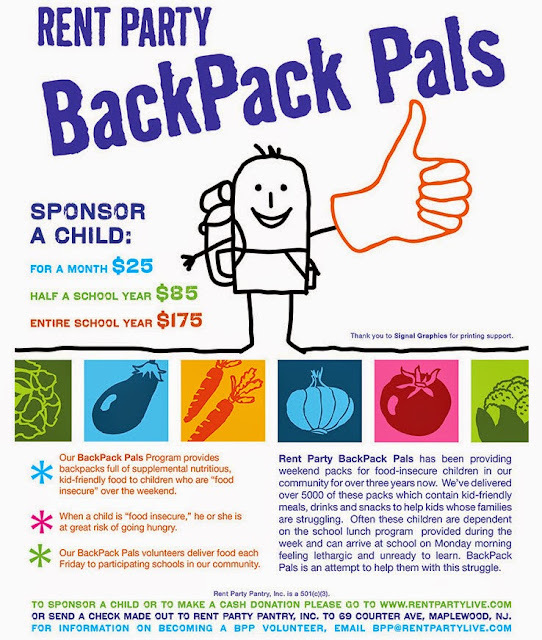 Our BackPack Pals volunteers deliver food each Friday to participating schools in our community. Fruit Cups, Apple Sauce, etc. The information in this infographic comes from a video of NAR Chief Economist Lawrence Yun talking about his 2015 housing market expectations. 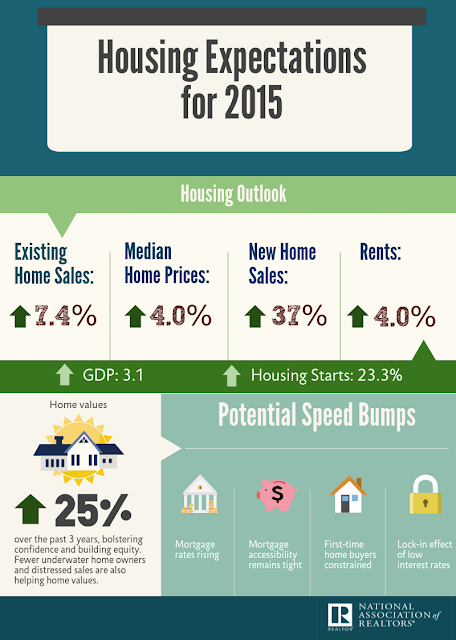 He expects existing-home sales to rise about 7 percent in 2015 behind a strengthening economy, solid job gains and a healthy increase in home prices. Watch the video of Lawrence Yun's forecast. Read the news release about Lawrence Yun's forecast. Happy new year. I'm pasting below two events organized by Playhouse Preschool in West Orange in the new year. Their parenting workshops are great - to TV or not to TV sounds like a good topic. Join us for a lively afternoon presentation and discussion on “Parenting Children in a Media World” with local parenting coach, Mary Funari. Playhouse Cooperative, Preschool and Kindergarten, 88 Franklin Ave. in West Orange. Please call 973-736-9451 to reserve a spot. 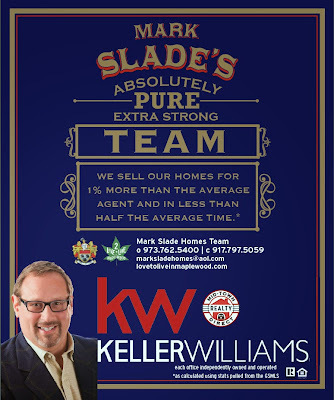 We have had a few steady years of escalating values in real estate in our beloved SOMA--South Orange/Maplewood area. The highlights are that average South Orange Sale Prices rose a significant 4.9% (may have been helped by the NY Times article this year: http://goo.gl/zrmr0f ), Average Days on Market dropped by almost 20%,to a touch less than 50 days, and average price paid was 99% of final asking price. 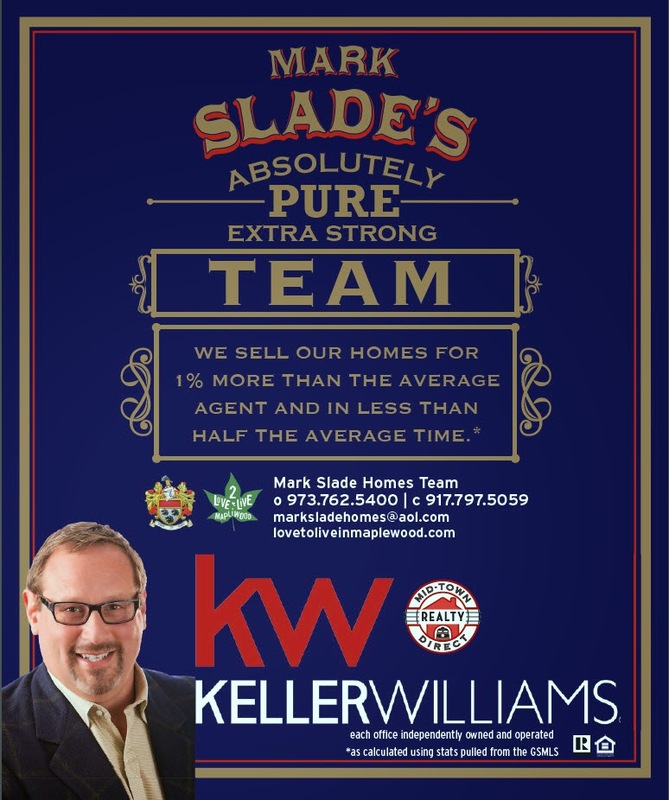 We have had a few steady years of escalating values in real estate and, according to my calculations, we are now about 98.7% of the average peak 2006/2007 housing prices. 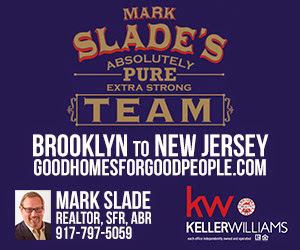 The highlights are that Sale Prices rose a significant 6.5% (may have been helped by the NY Times article this year: http://goo.gl/zrmr0f ), Average Days on Market dropped again and average price paid was 101% of final asking price.